The ruling coalition CDU / CSU and SPD rankings in Germany reached a historic low. After the failure in Bavaria and investigations against the Minister of Defense Ursula von der Lyayen a new blow to the authority of Merkel could be elections in Hesse. According to the latest Deutschlandtrend polls, the rating of the ruling coalition within the Christian Democratic Union (CDU), the Christian Social Union (CSU) and the Social Democratic Party of Germany (SPD) fell to a record low. For the three, they scored not only the half of the votes needed for control of the Bundestag, but considerably less - 39%. The CDU / CSU is supported by 25% of voters, the SPD is 14%. And all this in just two weeks. At the end of September, Social Democrats and conservatives enjoyed the support of 45% of the population. 17% voted for the SPD, and 28% voted for the Merkel faction. The root causes that pull the current government in Germany to the bottom are well known. This is all the same refugee crisis that formally ended, but its relapses are constantly felt. As during the September events in Saxony, where migrants killed a German. Disagreements over refugees caused serious tensions in the ruling coalition. Interior Minister Horst Seehofer, who constantly criticized Merkel for loyalty to migrants, came under fire from the SPD for interceding for counterintelligence chief Hans-Georg Maasen, who denied the beatings of migrants during the Chemnitz riots. There has been a crisis not only in the government, but also within Merkel’s own party. In a secret ballot in September, the CDU deputies dismissed one of the main allies and Merkel’s right hand, the head of the Volker Cauder faction, who held this position for 13 years in a row. Cowder supported Merkel and, at the expense of his authority, “forced” the CDU / CSU deputies to support her. 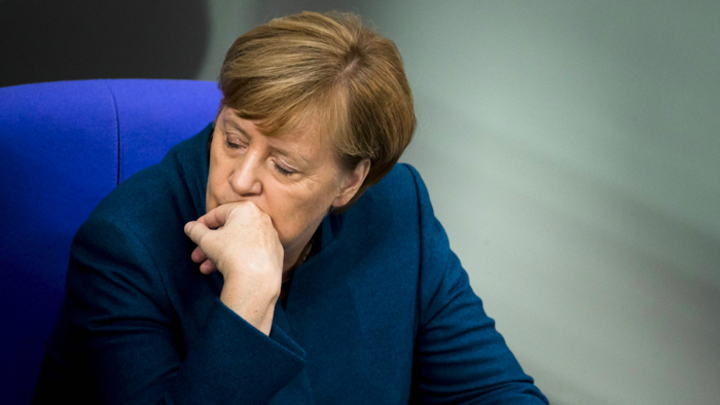 Against this background, authoritative German newspapers, for the first time, began to talk about the end of the era of Merkel and her departure. Now they have taken on another confidant of the Chancellor, Defense Minister Ursula von der Lyayen. The other day, the prosecutor's office of Berlin launched an investigation against her for hiring “external consultants” to work in the German Defense Ministry. This situation is very difficult for the Merkel faction, and especially for the SPD - this is a fiasco that they both experienced in the elections in Bavaria. Whether Merkel will remain in power depends on the outcome of the elections in Hesse. According to the latest forecasts, the CDU will lose its prime minister in Hesse. These elections may put an end to the coalition of the CDU and the SPD. Hessen is the only land where the Right Party Alternative for Germany (AfD) has not yet been represented. The land elections in Bavaria, where the CSU almost for the first time since 1945 lost an absolute majority of votes, gaining 37%, were another confirmation of the rapid decline in the influence of Merkel and her faction on German politics. Even if Merkel’s Bavarian sister would have wanted to join the coalition with the SPD (9.7%), she would not have enough votes to form a government. And if AfD will be able to gain at least 15% in this federal land, and the “greens” will come to power, then this will mean the end of the era of Mrs Merkel.